Keyes-Davis Wrist Bands and Tags are a great tool for pools, beaches, checkrooms, playgrounds, country clubs, gymnasiums, all recreational areas. Our Wrist Bands are made of excellent quality elastic with all brass hardware. Choose from many popular colors. Shown here are orange, green, white, black, red and green & white. We also have black & white, blue & white, red & white, orange & black, and orange & white. 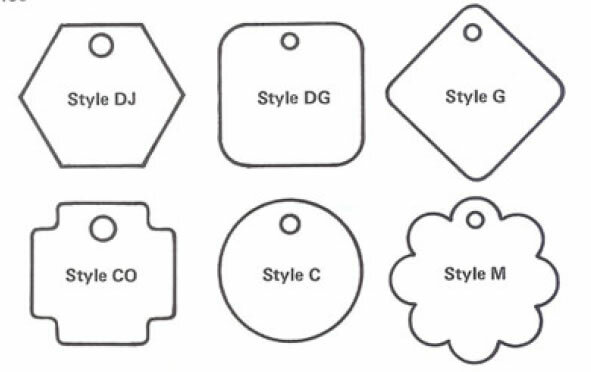 Plastic checking tags are 1/10" thick, 1 1/8" square or octagon. They are unaffected by water. Colors available are green, red, white or black. Furnished with holes for for attaching to our wrist bands. They can be stamped on one or both sides. 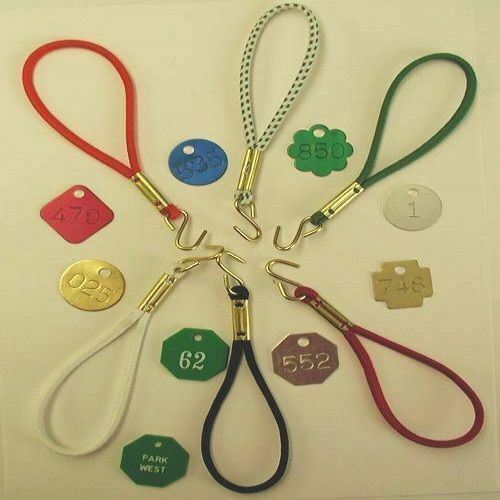 Metal tags are made from the finest aluminum or brass. They can be lettered or numbered with clear stamp indented characters. Stamping can be enamel filled with a contrasting color for maximum legibility.